Oconee County needs a Wake Up Call! See how Jackson County reacted to the Lease-Purchase mortgaging their future. They changed the BOC at the first opportunity . Oconee citizens need to review the Jackson mess. 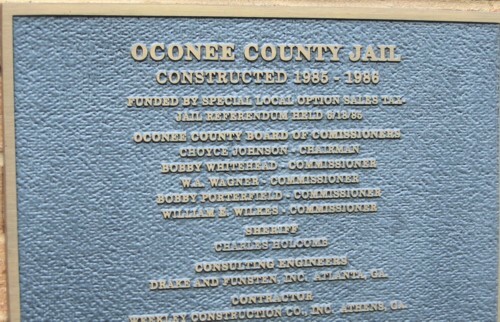 By Wendell Dawson , Editor, AVOC, Inc.
With little public hearing or input, Oconee's Commissioners have decided to tear down several buildings on GA 53 and build a new jail at three times the costs of the original SPLOST vote proposals.The news articles tell us how “cost effective” a new jail will be!Bullah! That is never the case!More deputies and jailers will be needed. There is never enough! The "new jail' is troubling enough but it seems that more projects are going to be funded by Lease-Purchase( Big Park- $ 10 Million; Reservoir $ 10 Million; Wastewater Treatment expansions -$ 140 Million) Soon we will be talking about some real money. Consultants, Bond Agents and Attorneys and the ACCG like these debt projects because they make money. However, it is a technical way of avoiding referendums by citizens (taxpayers).It is the mortgaging of our future by a "spendthrift" bunch of commissioners. It is obvious that the plans are to encourage more growth for future payments. This is a terrible policy.In no way does residential growth pay for schools, new roads and other overwhelmed infrastructure. While citizens of various communities are pre-occupied with zoning proposals in their neighborhoods, the Commissioners are quietly committing us to "fast growth" policies and huge debt to be paid by future Commissioners, School Officials and Citizens. Oconee County needs a Wake Up Call!See how Jackson County reacted to the Lease-Purchase mortgaging their future.They changed the BOC at the first opportunity .Oconee citizens need to review the Jackson mess. 9-2-05 Oconee County BOC Commits $,364,375 on New Park With Minimal Discussion or Info. 5-6-05 Bigger Courthouses, Bigger Jails- Bigger Egos or Male Thing? - One of those who got wind of the meeting was candidate Pat Bell, who trounced BOC chairman Harold Fletcher in the July 20 Republican Primary. Bell was upset that the IDA would even talk about giving the BOC millions of dollars for the projects in an atmosphere where the public had rejected the current administration’s leadership. Citizens for Oconee 's Future, Inc.
Five significant items stood out in this session. 1. In the first test of the Board's new revised rules for tabling rezone requests the Board continued as it did under the old rules, it voted to table the rezone application for the Garland Drive property. There is considerable citizen opposition to this rezone. A representative of the citizen's group came up during citizens comments and advised the Board that they are getting organized and will be heard at the rescheduled public hearing. Again it is good to see another community getting organized. Many are organizing as a result of negative impacts on their community from development and they are staying organized. Just in the last few months we have seen citizens in south Oconee , Barber Creek, and Gober Road organize. 2. The employee pay increase was delayed at the request of Chairman Davis. He stated that after discussions with members of the Board there are differences of opinion. He promised to provide them with information about the proposal before they are asked to vote on it. Folks, this a major step forward. In the past the Board has been expected to vote on whatever was brought up with little information available to help them make a decision. It is good to see the Board members show a little backbone for a change. Chances are much better for good Board policy decisions when they have the information. 3.The Board heard a presentation on the new jail that included announcement of a revised final cost of $ 10,363,719. They agreed to place that on the consent agenda for the 4/4 meeting which means there will be no further discussion. A significant issue that has not been adequately dealt with by the Board or followed up on by the press is the issue of lease purchase financing. Here is the point: Oconee voters voted for SPLOST (sales tax) funding of about $ 3.8m. The jail which the Board approved will cost almost three times the amount approved by the voters. By using "creative financing" the Board builds a jail not approved by the voters without going back to the voters. This must be paid by the general fund whether or not future sales tax is available. It will also cost far more than the stated $ 10.363M because the financing cost will be built into the lease payments. This is just a form of bait and switch. Citizens must be careful what they vote for in SPLOST referendums. 4. The Board heard an update on the Unified Development Code and Comprehensive Plan Process by Wayne Provost. Citizens need to watch this closely and be prepared to get directly involved. All the citizen groups around the county should have someone who has the time to get involved in this process. This code and plan will be the county development policy for the coming years. With this Board's development bandwagon rolling we must be very wary of what could come out of this process. Many will remember the changes that slipped through on the sewer policy and the ordinances for high density development. There will be several opportunities for input during public hearings but the real impact will be in participating in the process directly. Ask for drafts in advance, meet with the planning staff that is writing the ordinances and plans, talk to Commissioners during the process and talk to press outlets when there are issues that need public scrutiny. 5.The Board adjourned and went into executive session to discuss a land acquisition issue, personnel matters and litigation. Another secret meeting on important matters. There are supposed to be minutes prepared for these meetings and any votes taken are supposed to be done in public session. Will be interesting to see if any minutes are made available to the public. PutnamCounty and Jackson County Taxpayers will be paying more property taxes.Putnam County has a lower digest and is fighting higher expenses such as fuel and insurance. JacksonCounty is feeling pressure from the unchecked spending by former Chairman Harold Fletcher and his cronies.The Taj Mahal Courthouse debt, thanks to Harold Fletcher & Co and the ACCG Lease-Purchase program, will haunt Jackson Taxpayers for years to come. Citizens will tend to take their frustration and anger out on incumbents.However, sometimes, the fault may lie at the feet of predecessors. Other counties, including Oconee (New jail and Big Park ) are headed down that road.Citizens should not be surprised at the coming consequences considering the spending habits and needs of some local governments. Most Jackson County taxpayers are going to take a hit in the wallet this year. That’s a 10 percent increase in addition to any higher property assessments property owners may have. The future of a major decision in Jackson County rests in your hands. You have the power to either help, or hurt the citizens of Jackson County depending on how you respond to a request from our county government. At issue is the desire of our board of commissioners to use the ACCG to finance a new Jackson County courthouse. But that is a plan fraught with peril. There’s no argument that Jackson County needs a new courthouse. But the way this BOC wants to build and finance it has stirred up a firestorm of protest among our citizens. And now the BOC is attempting to pull the ACCG into the middle of that controversy. Obviously, you know the building of courthouses is often controversial. No matter what the BOC did, not everyone would be happy. But this board has so badly managed the effort, so arrogantly dismissed public opinion, that nothing good can now be salvaged. For a couple of years in the late 1990s, a citizens’ committee had been studying the courthouse issue. I didn’t agree with all aspects of that effort, but at least an effort was being made to include the public in the siting and planning process. Then in 2000, we elected a new five-member BOC. During 2001, they were silent in public on the courthouse issue, although they did apparently meet in secret with the courthouse committee a couple of times! MADISON - Reps. Doug Holt, R-Social Circle, and Bob Smith , R-Watkinsville, are sponsoring legislation to establish a build­ing authority eligible to issue revenue bonds to finance public works projects by the Morgan County government. House Bill 1584 comes as the Morgan commission considers priorities for a refer­endum on extending the county's special purpose sales tax (SPLOST) in the November General Election.Road projects, a convention/community center, water and sewer authority, solid waste facilities, a gov­ernment administration complex and a new or renovated jail were among possible proj­ects identified by county commissioners during a recent meeting. "The (authority) was recommended by the Association County Commissioners of as a way to secure lower interest rates on bonds," said Morgan County Manager Michael Lamar. City and county governments sometimes assume bond debt in order to undertake des­ignated projects more quickly - without waiting for sales tax revenues to trickle in over a typical five-year levy. The bill provides that the county'~ five elected commission members would dually serve as members of the building authority, and conveys the group wide-ranging author­ity, including condemnation rights (eminent domain} in support of development. No restrictions on projects eligible for public debt are incorporated in the legisla­tion. "Project shall mean and include real and personal property, including buildings and related facilities and equipment which are necessary or convenient for the efficient operation of Morgan County ," the biII states. County commissioners are authorized to pledge any form of county revenues, such as property taxes or sales taxes, to repayment of bonds, and they could also pledge antici­pated revenues Commission.